His dad was also a centre-half for Cumnock, and was set upon by a brolly-wielding woman from Auchinleck who invaded the pitch. "She was well known, she served the teas after games at Auchinleck, or something like that," McCulloch said. "She's died since then, but I went to the funeral - [the rivalry] is not that bad." In one game during the 1990s at Cumnock's Townhead Park, an Auchinleck Talbot winger kept being hit by cigarette butts flicked at him by the home fans. When the ball went out for a throw-in, he picked one cigarette up, briefly smoked it, and then complained loudly about the quality of Cumnock tobacco. "I had folk hanging over the surrounds [swearing] at me, trying to catch me and trying to hit me," said McCulloch. "It all comes from the miners working down the pits. I was a miner and believe you and me, life wasn't worth living if you got beaten. "The cage held 150 men going down the pit. On a Monday morning, if you got beaten, everybody's shouting and screaming, but if you won, it was great. "The two teams are close to one another [geographically], but the rivalry and the bitterness stopped once you got to the coalface, you had to depend on one another. It was good banter and good fun. "An Auchinleck man had to watch your back for a lump of coal falling, things like that. The rivalry just got nasty during the games. It's not as intense now, because the pits are shut." McCulloch is one of the towering figures in Cumnock's history. He twice won the Scottish Junior Cup with them during his 18 years of service. 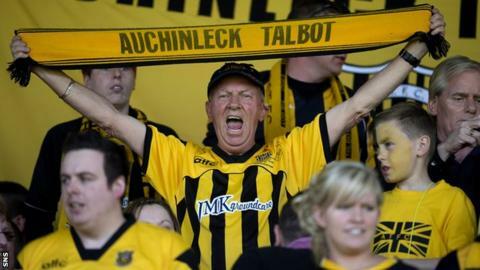 He euphemistically remarks that he "was not a gentleman on the pitch", but chuckles when he adds that "Auchinleck people will word it in a different way". After being sent off in an Ayrshire Cup final, he kicked the trophy as he walked past it on the touchline, sending it bouncing along the ground. The damage had to be paid for. On another occasion, McCulloch was asked to play for Talbot in a testimonial match for the family of a young player who had died. The prospect of seeing McCulloch, one of the great Cumnock men, in a Talbot jersey drew a larger crowd - which was the point. He was made captain for the day, and led the team out wearing a Talbot training top. All the fans were baying for him to take it off. When the referee called the captains together to toss the coin, he took it off to reveal the Talbot jersey. Then, as he walked to the centre circle, he lifted it to reveal a Cumnock jersey underneath. "It's just fun," said McCulloch, who was born next to Townhead Park and still lives so close to the ground that he never misses a game and regularly walks his dog round the stadium. The allegiance to each club runs bone deep, though. For all that McCulloch was willing to play along for the benefit of charity, when he left Cumnock at the end of his 18 years at the club, the first team on the phone offering him a contract was Auchinleck. "My words were: 'I'm a Cumnock boy and I'll no do a Mo Johnstone on Cumnock," McCulloch explained. "They promised me a junior cup medal, but I said: 'why would I want a junior cup medal with you guys'. I took it as a bit of an honour, not because it was Auchinleck but because they were a First Division team and I ended up going to a Second Division team, Ardrossan Winton Rovers [who played in the same black and white colours as Cumnock]." Auchinleck have established their dominance in recent years, including a series of Scottish Junior Cup triumphs - 10 in total to Cumnock's two. The rivalry remains intense enough to be able to draw crowds of more than 2,000, the kind of attendances that some senior clubs would welcome. There might be an element of supporters seeking a thrill from what the encounter has been capable of, but following the closure of the pits and the general commercialisation and cleansing of football - even the junior game - there is less of the aggressive posturing. "As clubs, we both get on well with each other, there's always been a healthy respect with each other during my time as secretary, which is going on 33 years now," said Henry Dumigan. "There has been a healthy rivalry on the terracing - sometimes too healthy. "There are occasions where people crossed the line. It doesn't happen too often, though. It's nowhere near as bad as it used to be. I don't know if that's because we no longer have the pits, or maybe people are getting more understanding, but I don't find it too bad now." Occasionally, though, players do turn out for both clubs during their career. It tends to make an impact. George Morton played for Auchinleck during the 1964-65 season, having played a few games for Cumnock - his team and the team of his father - in 1962-63. "I'm the only person who's ever scored a hat-trick at Townhead Park for Auchinleck [in a 9-3 defeat for Talbot]," said Morton, who has been the Cumnock secretary for 39 years. "When I came off the park, the [Auchinleck] secretary said, 'well done', and I said, 'no, if it had been 2-2, the third one would have been in the street behind the goals'."